In over a decade of watching over 200 movies a year, and trying to seek out independent movies, I've never seen a film about gay black men. That's really quite something when you think about it. And so it's deeply refreshing and heartening to see MOONLIGHT capture critical praise. That said, while I found much to admire in its intent and some of its performances, it was a less moving and impressive watch than I had anticipated. 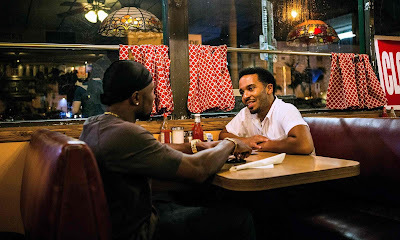 The film is written and directed by Barry Jenkins, based on an unproduced play by Tarell Alvin McCraney and is based on their childhood experience of growing up gay in a deeply dysfunctional black community in Florida. What's impressive is that they manage to subvert the stereotypes of the black drug dealer and the crack whore, and the entire concept of masculinity by showing us what they know. The result is a film that feels claustrophobic and melancholy - of a community that is fundamentally dysfunctional, in which its members feel trapped, but where there is some slight hope of escape. It's also a community that feels odd to English eyes insofar as it's so un-diverse - the only white face we see is a cop. The formal structure of the play carries over to the film: we meet our protagonist at three ages, in three thirty-five minute segments. In the first part he's a skinny schoolkid called Chiron (Alex R Hibbert), bullied for being camp, who finds solace from his crack addict single mother with a drug dealer called Juan (Mahershala Ali) and his girlfriend, Teresa (Jangle Monae). Against all expectations, it's the drug dealer who proves caring, understanding and comforting - even going so far as to tell young Chiron that he doesn't need to figure out of he's gay yet, and even if he is, he shouldn't feel ashamed of it. Moreover, Juan is morally complex, at once judgmental of Chiron's mother's drug addiction, but also conscious that he's the man selling to her. The power of Ali's performance in this segment is quite dazzling, and I'm not sure the film ever really recovers from his absence. In the second segment, a teenage Chiron has his first gay experience with a fellow schoolkid called Kevin, but in a sequence of tragic inevitability, the bullying finally pushes him to violence and he ends up in jail. We also see his mother (Naomi Harris - perfect accent, subtle and superb depiction of ageing and addiction) at her most terrifyingly unstable. But this is all so much set up for the third act when we meet the adult Chiron. I won't spoil what happens to him or his mother but suffice to say that for me, the performance of Trevante Rhodes is one of the highlights of this film. And the concept of yearning and longing for a love that you think you can't have universally relatable beyond the highly specific and authentic setting of this film. If I have any reservations about this film it relates to the sense of imbalance once Ali leaves the screen; the overuse of the mobile camera and swings from close up to out of focus from DP James Laxton - sometimes it works to heighten the POV of Chiron but mostly it just called attention to itself and took me out of the film; a sense of a lack of pacing in the third part of the film, and a somewhat jarring non-ending. Nonetheless, this is a film that remains important both in its content and impressive for some of its performances. And of the two Oscar contenders, I only wish the Academy had the courage to back this, the more brave, more accomplished and more vital film. MOONLIGHT is rated R and has a running time of 111 minutes. The film played the festival circuit last year, including Telluride, Toronto and London. It opened in the USA last year and earlier this year in Australia, Greece, Israel, the Netherlands, Mexico, Belgium, France, Argentina, Croatia, Portugal, Estonia, Denmark, Peru, Spain, the UK, Norway, Sweden and South Africa. It opens this weekend in Hungary, Italy and Poland. It opens on February 22nd in South Korea, Brazil, Hong Kong and Russia; on March 2nd in Italy and Taiwan; and on March 9th in Chile and Germany.